… in the general idea it conveys. In our opinion, tactics takes up 99% of the player’s thinking time, but one thing is sure: we cannot underestimate the importance of tactics in chess. That is why we introduced the new puzzle statistics module, where teachers and students can follow their progress, strengths and areas for improvement in real time while exploring the different tactics. The first table contains the puzzle solutions by difficulty levels. 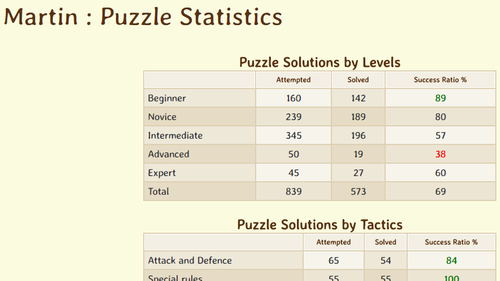 You can see the number of attempted puzzles in the first column, the number of correctly solved puzzles in the second one, and the solution ratio in the third one. We display each solution ratio where the success rate is above 80% (after 20 attempted puzzles) in green and mark the ones below 50% with red. The second table contains the solutions by different tactics. As one puzzle can contain more tactic themes, the total number of tactics attempted is virtually larger in this table than in the previous one. 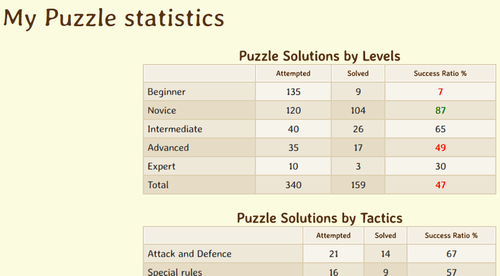 We display the number of attempted puzzles in the Learning Management overview screen too. By Clicking on this number, the teacher can check the detailed solution statistics of the given student. Hi, guys, what do you think about cooperation with https://www.chesswizards.com ? We provide chess education for kids.